Welcome to the Mopar Enthusiast Ring, one of the internet s oldest and largest online communities devoted to mopars. If your a fan of Chrysler, Dodge, and Plymouth vehicles you’ll want to bookmark this site. If the term Mopar is new to you or to find out more about our members hobby check out our What Does Mopar Stand For? page. Our Mopar Or No Car Online Community comprises of three diverse sections for easy navigating.. Personal Mopar Sites – Cruising the Mopar Ring is a great way to locate personal web sites and pages devoted to Chrysler, Plymouth, Dodge and Mopar including the adopted brands AMC, Jeep, Eagle etc. Joining is totally free and is a great way to get more people to visit your site. Mopar Club & Organization Sites – Cruising the Mopar Club Connection is a great way to locate Club & Organization sites and pages devoted to Mopar. Joining the Mopar Club Connection ring is totally free and is a great way to get more people to visit your personal or club site. Mopar Parts & Services Sites – Cruising the Mopar Parts & Services Connection is a great way to locate business web sites offering parts and/or services for Mopar related vehicles. Joining is totally free and will boost your companies site traffic. It also gives our visitors a valuable resource on what companies offer for Mopar enthusiasts. 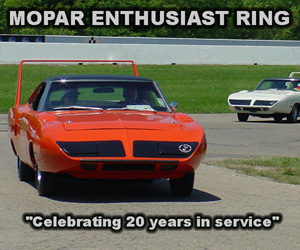 The Mopar Enthusiast Ring site also offers visitors a great selection of connections devoted to related Mopar topics including: Chrysler, Dodge, Dodge Challenger, Dodge Charger, Dodge Dart, Dodge Dakota, Dodge Dakota R/T, Dodge & Ram Truck, Plymouth and more. The Mopar Enthusiast Ring Server also hosts a great collection of Mopar related stuff, including a Mopar only classifieds, Mopar News, Mopar Photo Gallery and free screensavers featuring Mopars. The Mopar Ring server offers valuable resources for locating information on Chrysler, Dodge, Dodge Truck, Plymouth and Mopar sites & vehicles. Including Business sites offering parts or services to the Mopar owner community. The mopar-ring.org server was built for Mopar Enthusiasts by Mopar Enthusiasts!